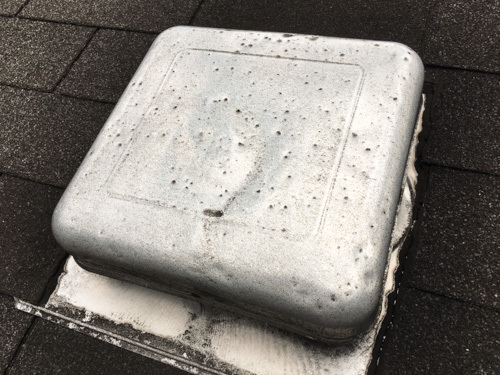 Having spent over 20-years in the gutter, we’ve seen plenty of good, bad and ugly roofs. When we first visited this home in Whitehall, just outside Columbus, Ohio, we could barely see the roof among the two large fir trees that enveloped the front of the home. 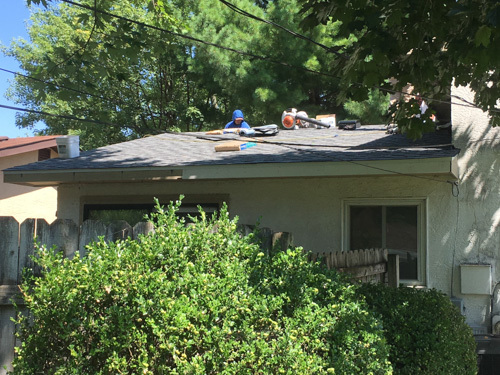 We were called by the homeowner to provide an estimate for new gutters and gutter guards. The gutters were plastic and had more or less fallen apart. They were crammed full of pine needles. The roof had pine needles inches thick on top of the shingles and the limbs from the fir trees were overhanging the house. Candidly, it was a mess! 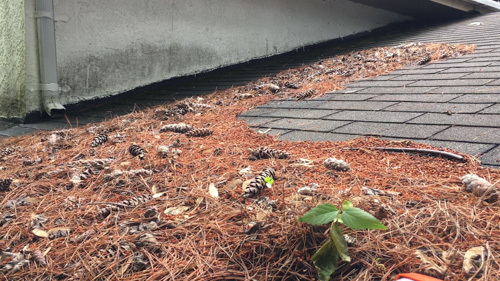 What’s the best gutter guard for pine needles? 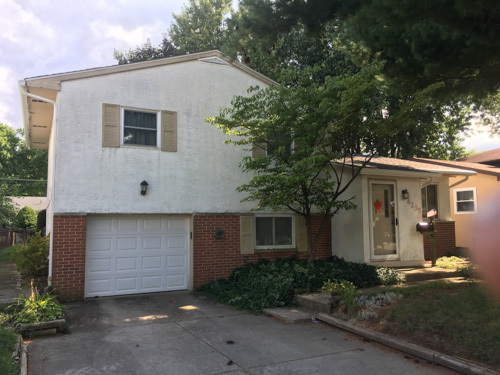 The homeowner said that she was looking to move within a year or two and wanted to make improvements to her house without breaking the bank. We agreed that replacing her undersized 4″ plastic gutters with 5″ aluminum gutters would do the trick. 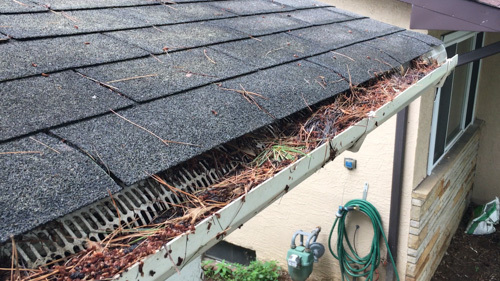 Because she had two large fir trees, I recommended MicroScreen gutter guards as the only way to keep pine needles out of her gutters. 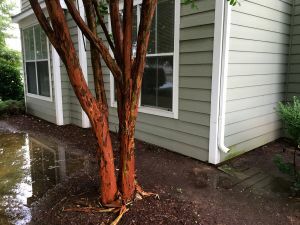 Since the plastic gutters had performed so poorly, and perhaps because those gutters were full of pine needles and debris, the water had accumulated inside the gutter and spilled over onto the facia boards. Continuous water overflow caused several of the boards to rot and decay, so those, too, needed to be replaced. 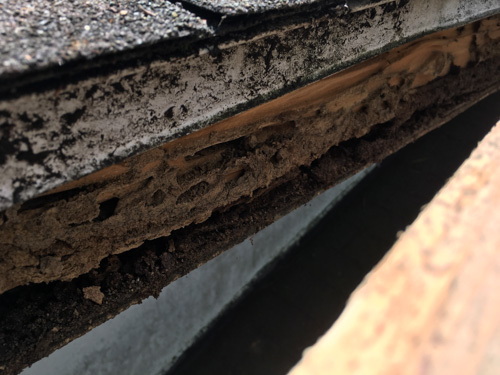 When we arrived on the scene to replace the bad facia boards, we found that termites had invaded the wood and the sub-facia that was attached to the rafter tails. 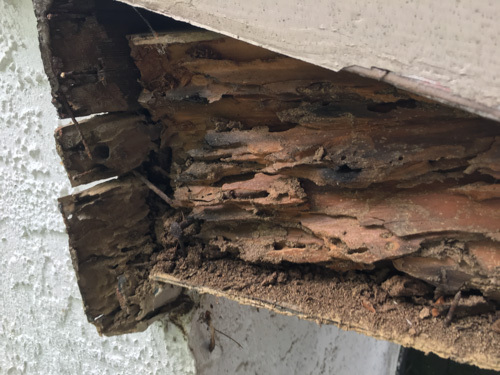 A combination of water and termite damage meant that we had to replace a fair amount of wood on the house, including some soffits. 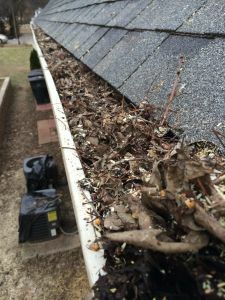 What started out as a gutter and gutter guard job barely got off the ground before we identified another serious problem. 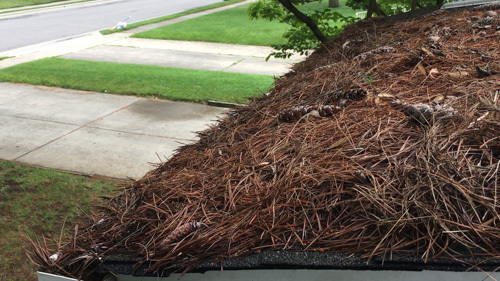 When we climbed onto the roof to sweep off the pine needles, we found extensive hail and wind damage on the shingles. 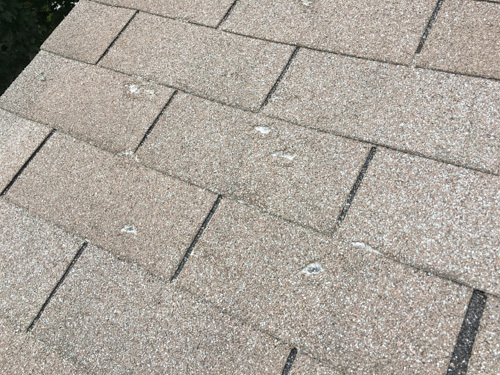 Several rows of shingles had been torn and much of the roof had large divots where the hail stones had impacted the shingles, exposing the fiberglass lining. Ditto for large dings on the aluminum roof vents. 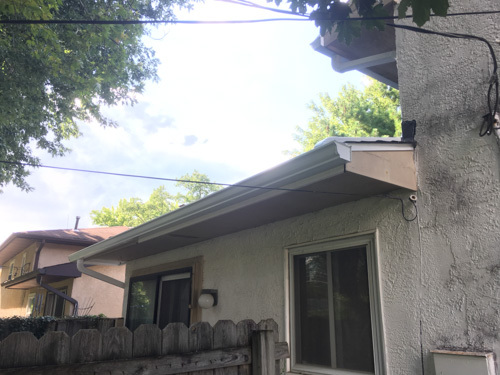 We have helped customers with their insurance claims for gutters, gutter guards and roofs, so I took pictures and showed the homeowner the extent of the damage. I told her that if she called her insurance company, we would work with the adjuster to help get her a new roof for the cost of her deductible. She agreed that was a good idea. 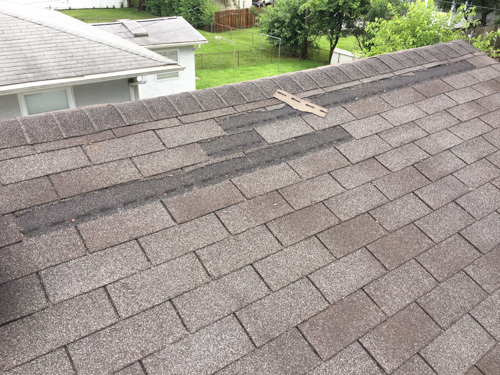 Once we replaced the damaged wood, we put the project on hold until the insurance adjuster could assess her roof. Fortunately, he agreed that her roof was badly damaged by wind and hail, and the insurance company paid for a new roof. 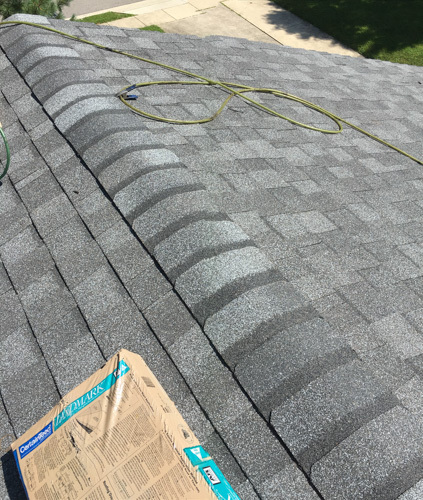 We facilitated the entire process, interfacing with insurance, helping the homeowner select new shingles, and overseeing the installation of the new roof. 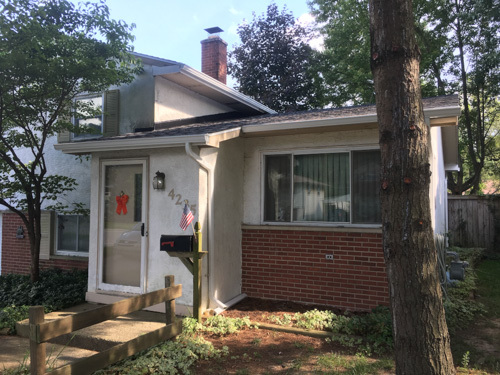 We were able to upgrade the homeowner from 20-year, three-tab shingles to lifetime architectural shingles, and we were able to install the roof shortly after insurance approved the claim. Because we were on the job site and knew what to look for, and because we have years of experience working with insurance to make sure homeowners get what they deserve when they have sustained weather related damage to their home, the value of our service far exceeded her expectations. 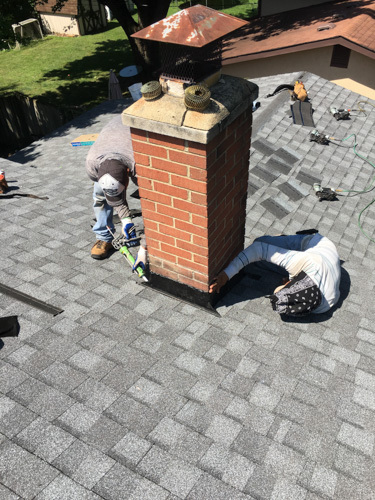 As part of our service, we upgraded her shingles at no charge, we installed new step and counter flashing around the chimney and along the side wall, ensuring that her new roof will be weather and water tight for years to come. Couple this with removing damaged and rotted facia and soffit wood, upgrading her gutters from plastic to aluminum, and installing MicroScreen gutter guards to keep pine needles, maple seeds and oak tassels out of her gutters, this homeowner received an extreme home makeover. The only thing that we won’t be doing is painting her house, but she has scheduled that work to be done by a neighborhood painter friend. Quality vs Quantity: Which would you choose? 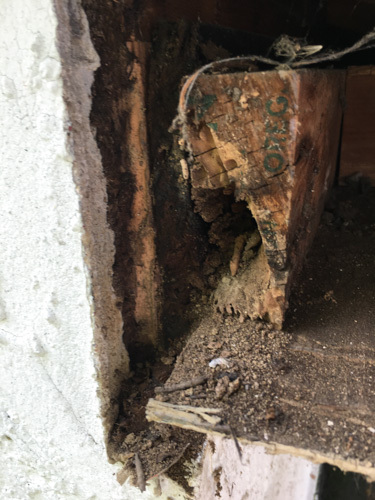 I can’t help but think that if she had hired another gutter contractor to do this work, would they have made cosmetic changes to the wood — covering up the termite damage — installed gutters and gutter guards and walked away? 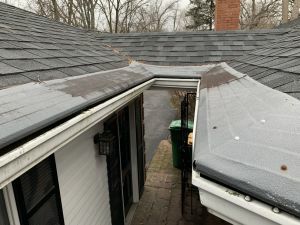 We took this project several steps further by knowing how to recognize hail damage and walking her through the insurance claims process — making sure that she received a fair resolution for her claim. Roof? Check. Gutters? Check. 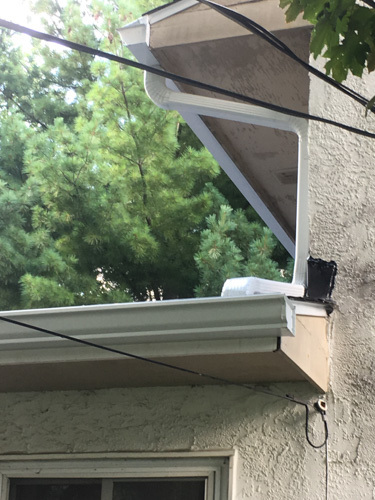 Gutter Guards? Check. Insurance? Bonus Check! Her bonus was that she received a brand new $7,000 roof for the cost of her deductible. 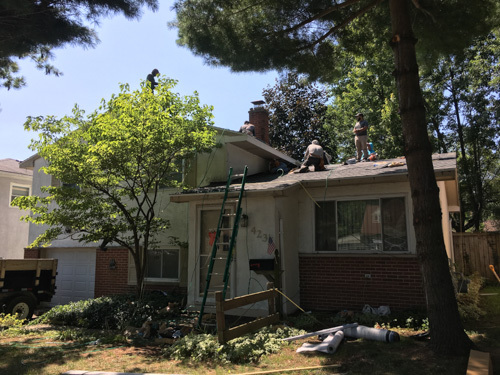 In addition to new wood, gutters and gutter guards, the new roof will add considerable value to the sale price of her home, and it gives the home way more curb appeal than before. The benefit for us is that we were able to leverage our knowledge and expertise to provide a value-added service that went above-and-beyond the reason why she hired us, but is well within the scope of our capabilities. If you are interested in a win-win partnership, we believe we’re the best at what we do, and we’d be happy to provide you with a free estimate for new gutters and gutter guards. Who knows, if you hire us, you, too, might get a new roof for the cost of your deductible! Gutter Guards Direct services greater Columbus, including Dublin, Hilliard, Clintonville, Grandview Heights, German Village, Upper Arlington, Worthington, Powell, Pickerington, Plain City, Bexley, Blacklick, Gahanna, Delaware, Granville, Grove City, Westerville, Newark, and New Albany, Ohio. Call 1-614-356-8164 for a free estimate.